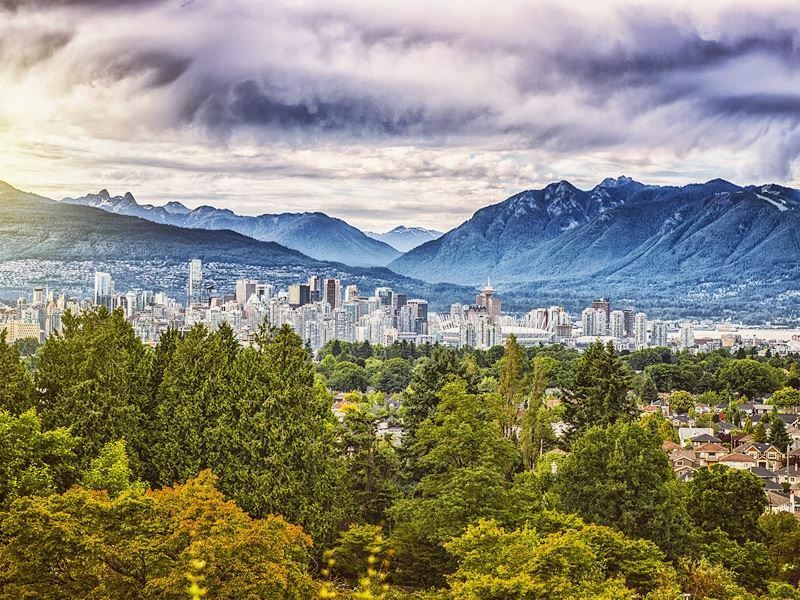 Canada’s fjord-slashed coastlines, arctic tundras, snow-capped mountains and prairie expanses may get all the glory, but its urban skyline is equally worth shouting about. 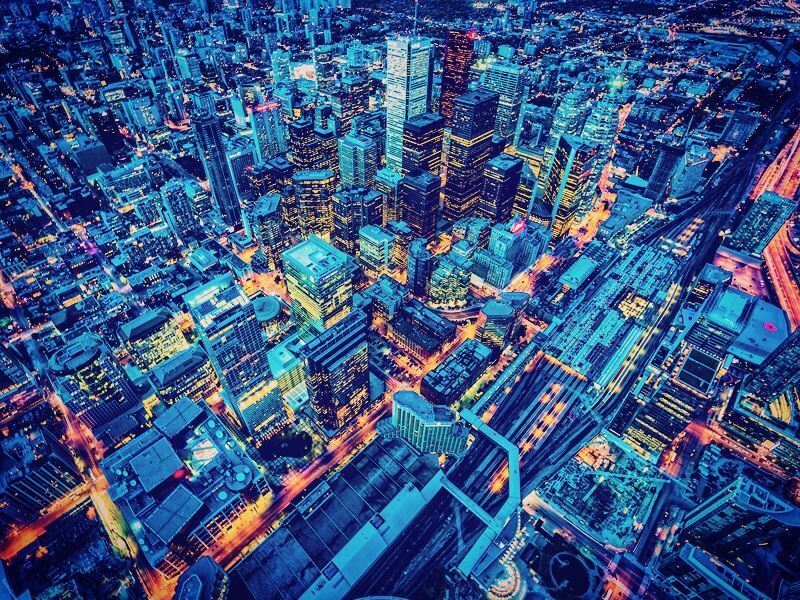 Here’s 10 of our favourite vistas in Canada’s coolest metropolises. It’s all pop-art-coloured houses clinging to steep cliffs at The Battery - a small community at the entrance to the harbour in Newfoundland and Labrador’s provincial capital of St. John's. Decked out in a rainbow of hues including deep lilac, sunny yellow, cherry red and turquoise blue, what’s been brilliantly-named ‘Jellybean Row’ is a higgledy-piggledy cluster of Victorian terrace houses built as temporary accommodation after the devastating Great Fire of 1892. As for the playful and bright exteriors, legend has it this was so returning sailors could simply look up to the hills and easily spot their homes. After snapping away at this vibrant landscape, further city pleasures include marvelling at the iconic Cabot Tower, hitting the too-cool boutiques, cafés, restaurants, pubs and art galleries, and hiking up Signal Hill where Marconi famously received his first transmission across the Atlantic in 1901. 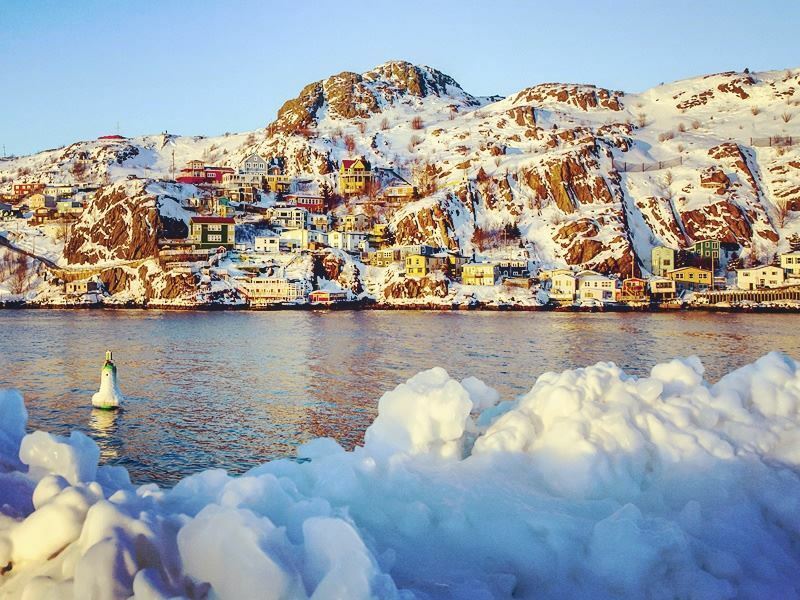 Equally worthwhile is the short drive to the picturesque fishing village of Quidi Vidi for its famous Plantation - a unique craft ‘incubator’ designed to accelerate the growth of up-and-coming local artists. 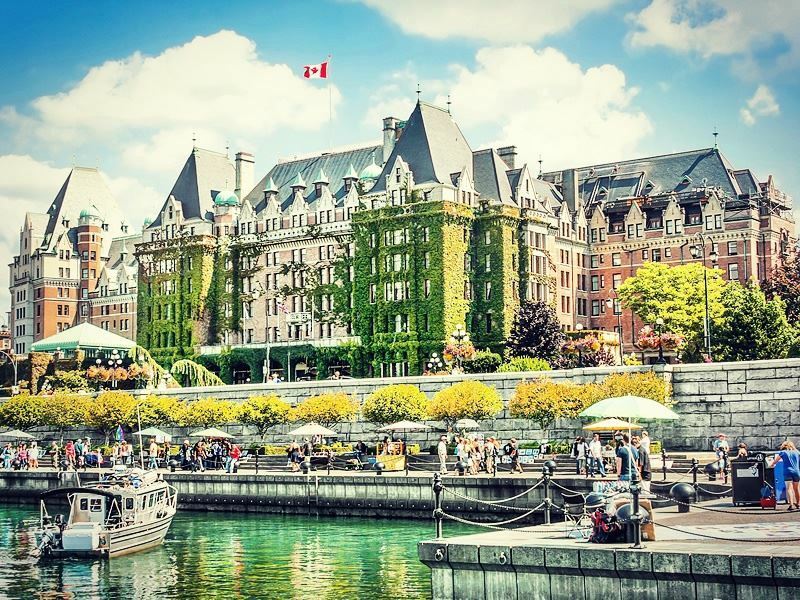 There’s no shortage of yacht-watching thrills at Victoria’s Inner Harbour - the beautiful port that plays host to all sorts of hip artisan markets, supercool street performances, and trendy music festivals during the summer months. Superbly overlooked by the historic and rather grandiose Empress Hotel that was built in 1908, it raises the bar for camera buffs; mostly for its floatplanes, sailboats, passenger ferries, whale-watching vessels, and 200-plus cruise ships. To capture the city’s soul, grab the Harbour Ferry for a 45-minute tour of the Gorge Waterway that connects Victoria Harbour to Portage Inlet, stroll along the pedestrian walkway known as The Causeway, and head to the James Bay waterfront where the breakwater offers a different perspective of the city. Further delights include marvelling at the illuminated Baroque-style British Columbia Parliament Buildings at night, touring the Victorian-era Craigdarroch Castle, taking a horse-drawn carriage ride at Beacon Hill Park, and snapping the colourful houseboats at Fisherman’s Wharf - the floating community that’s a ten-minute walk from Inner Harbour. 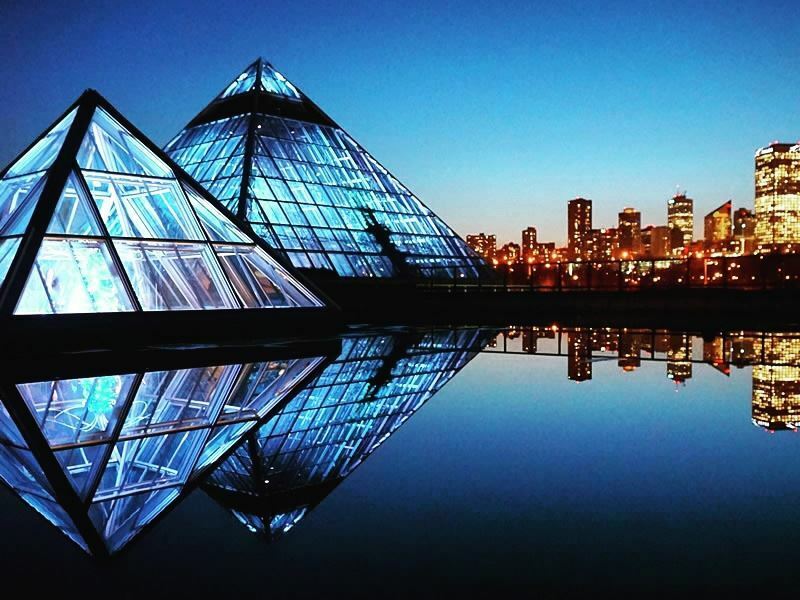 Adding a shot of glamour to the Alberta capital that’s most famous for an annual fringe festival that’s second only to Edinburgh's, the Muttart Conservatory houses Canada‘s most groundbreaking collection of botanical gardens in four architecturally-stunning glass pyramids. Designed in 1976 by award-winning Canadian architect Peter Hemingway in a bid to fuse art and nature, three of these dazzling Louvre-like structures (Arid, Temperature, Tropical) showcase year-round displays of different biomes while the fourth (Feature) changes its exhibits on a frequent basis. Indoor photography is permitted, but after you’ve had your flowery fix it’s well worth heading outdoors to snap these striking structures that rise from the river valley and frame the city skyline. Should time allow, the sandstone and granite Alberta Legislature Building is only a seven-minute drive away and well worth the effort for its Neoclassical grand columns, Beaux-Arts architecture, landscaped grounds, and magnificent artworks. As the undisputed historical jewel of the province, it has been the home of the Legislative Assembly since November 1911. The Street Art Renaissance has been raging in Montreal for the past two decades, rewarding creative types committed to bringing out the beauty of the urban landscape with worldwide fame. To capture the eye-popping murals, graffiti-style painting, sculptures and art installations that characterise virtually every corner of the city’s storied streets, head to Rue Saint-Denis, Rue Duluth, and Saint-Laurent Boulevard (nicknamed The Main). Most of the neighbourhoods are best explored on foot (or on a guided walking tour), especially if you’re vying for more under-the-radar works found in less obvious places such as doorways, back alleys, and abandoned parking lots. 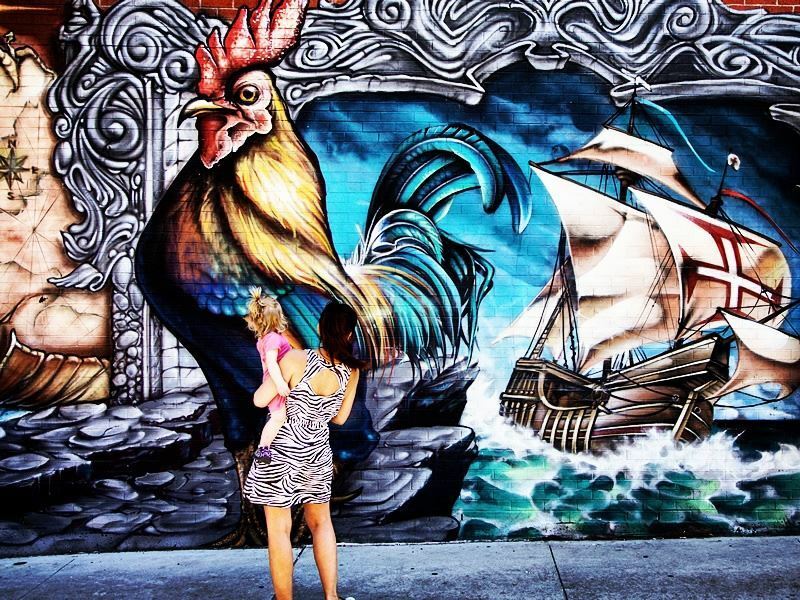 Should you be lucky to visit here in June, don’t miss the 11-day MURAL Festival - the hippest addition to Montreal’s annual festival roster that’s been a huge deal here since 2013. As well as getting into the party spirit with dance battles, block parties, live music and gourmet-style street food, you’ll get to see artists at work on building-sized canvases in and around Saint-Laurent Boulevard and also watch the unveiling of 20 brand new murals. 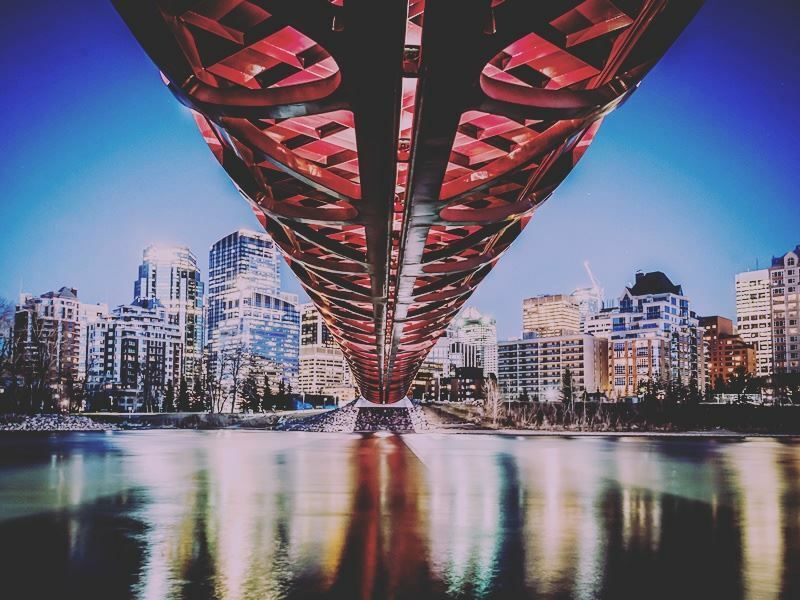 As one of the best-looking bridges on the planet, the $24.5 million red-and-white tubular Peace Bridge has done more for the city of Calgary than just increase choices for pedestrians and cyclists crossing the Bow River from Sunnyside or downtown. Spectacularly designed by award-winning Spanish architect Santiago Calatrava, this 85-ton and 130-metre-long structure has been grabbing headlines since it opened in March 2012 - mostly for its highly-technical and challenging design scheme that eliminated the need for beams, arches, cables or lower supports other than embankments. Covered in tempered glass for year-round use, it’s a shutterbug’s dream at any time of day, especially as the backdrop happens to be the gleaming downtown skyline. Also a pleasure to photograph is the 191-metre-high Calgary Tower that’s home to the highest 360° observation deck in the world. If you’re visiting in July, don’t miss the rip-roaring Calgary Stampede - a ten-day event that hosts the granddaddy of rodeos where cowboys ride it out for a staggering $2 million dollar prize as well as the esteemed championship title. 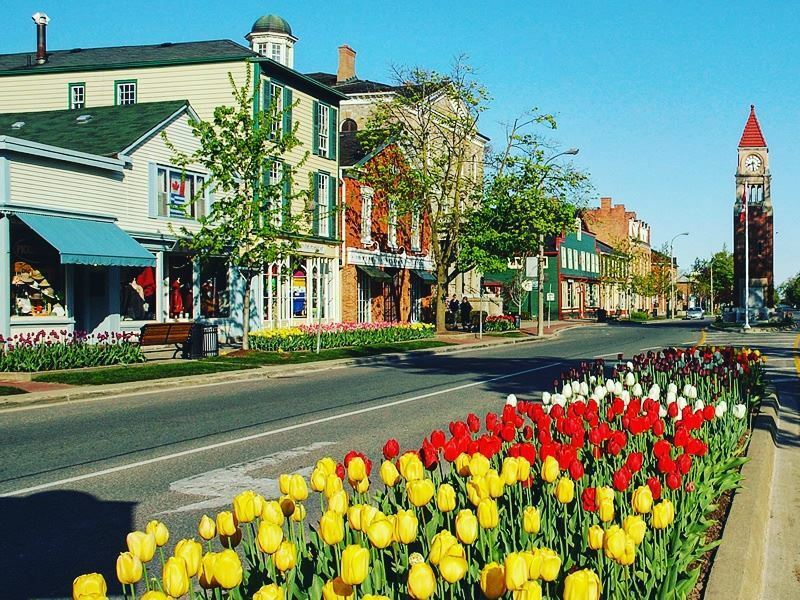 Only a 30-minute drive (or two-and-a-half hour cycle) from Niagara Falls, the pretty 19th-century town Niagara-on-the-Lake gets all the glory for its world-class wine estates and boutique wineries - most of which have tasting rooms and offer behind-the-scenes tours. But there’s more to Ontario’s wine region than just grapes; mostly the world-famous Shaw Festival (April to October) that has been featuring the works of Irish playwright George Bernard Shaw and his contemporaries for over 50 years. Theatre-lovers can choose from four venues: the large Festival Theatre and the substantially smaller Court House Theatre, Royal George Theatre and Studio Theatre. For photo-ops galore, wander along the town’s boutique-lined Queen Street, take a candlelit Haunted Walk tour to hunt for ghosts, visit Canada's bloodiest battlefield at Old Fort Erie, and hit the Niagara Park Recreation Trail for gorgeous views of the Niagara River and sun-dappled forests. Equally thrilling is a ride over the Niagara Whirlpool in the Aero Car - the unique-looking red and yellow open-air cable cars that have been in operation since 1916. Blessed with a glittering cityscape, ocean views and majestic mountains, the British Columbia’s city Vancouver is a photographer’s playground. For dynamic shots at ground level, your first stop should be Stanley Park for its brightly-coloured First Nations totem poles, exquisite flower gardens, sandy beaches, and wildlife-filled forest trails. Equally rewarding is Gastown for its cobblestone streets lined with Victorian buildings, artisan shops and heritage monuments, and Granville Island for its vibrant public market and frenetic street activity. Alternatively, take to the skies in a seaplane to shoot the awe-inspiring Capilano Suspension Bridge, the Olympic Village around False Creek, and the top of the mighty 1,127-metre-high Grouse Mountain. Further postcard-worthy vantage points include Cleveland Dam for shots of Capilano Lake with the snow-capped Lions in the background, Mount Seymour for the city and entire Lower Mainland, and the Vancouver Lookout observation deck atop the Harbour Centre for 360-degree views of the Pacific Ocean, North Shore Mountains and Olympic Peninsula Mountains. What looks like a giant hypodermic needle piercing the Toronto skyline is the CN Tower - once the world’s tallest freestanding tower at 553.33 metres. Classified as one of the Seven Wonders of the Modern World by the American Society of Civil Engineers, this iconic telecommunications hub has enthralled shutterbugs for the past 40 years - with many spending hours casing out the city to find different angles and challenging new perspectives. Both the SkyPod and even higher LookOut Level will provide you with off-the-scale fantastic shots. But for adrenaline junkies, nothing beats the EdgeWalk - the world's highest full circle, hands-free-but- harnessed walk along a 1.5-metres-wide outdoor ledge that encircles the tower's main pod. Back on ground level, the restored Distillery District is a stunning backdrop for those keen to get a real feel for the city’s history and heritage. Head here to shoot cobblestone lanes lined with the nation’s best-preserved collection of Victorian-era buildings and make the most of the area’s hip boutiques, design stores, artisan shops, art galleries, restaurants, and cafés. 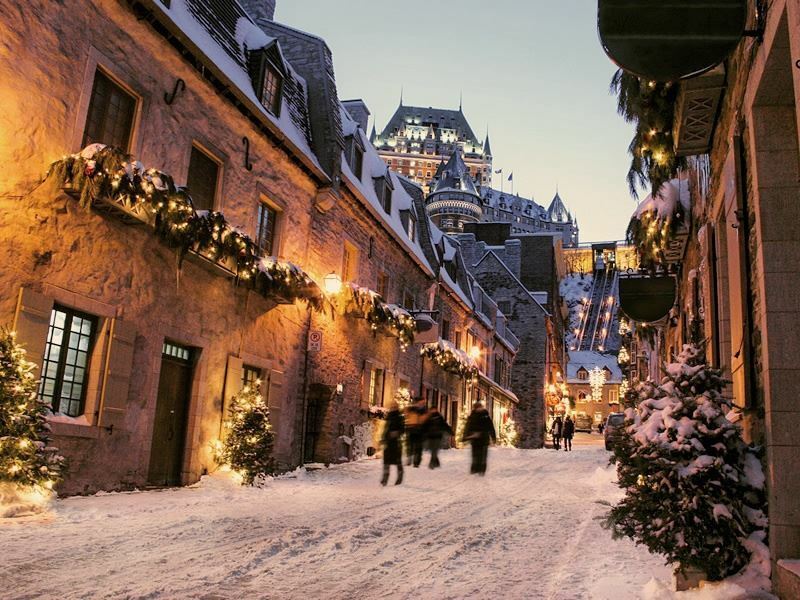 Few hotels define an urban skyline like the fairytale-like Fairmont Le Château Frontenac - the UNESCO-listed grand dame that holds the Guinness record as the World’s Most Photographed Hotel. Built in 1883 for the fancy folk who travelled via the Canadian Pacific Railway, its location couldn’t be more spot-on; perched atop Cape Diamond and superbly overlooking Dufferin Terrace and the St. Lawrence River. 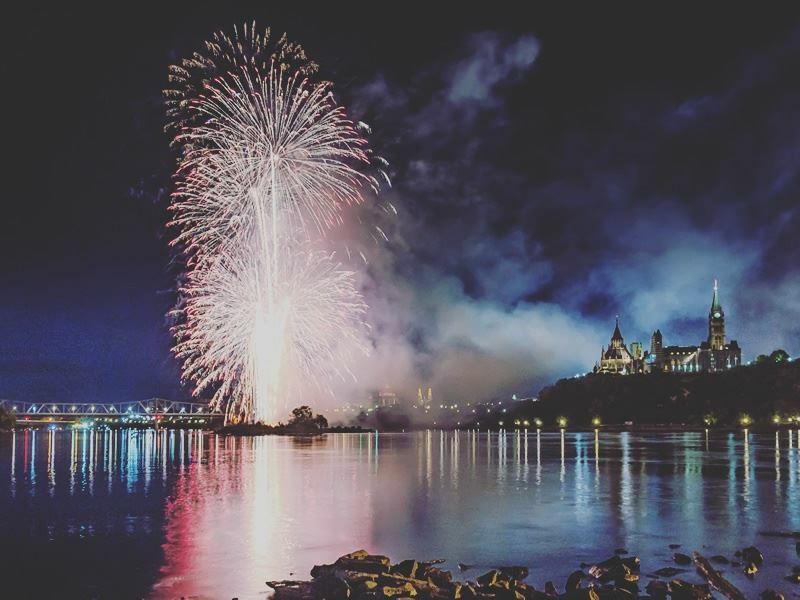 If you’re not lucky enough to be staying in one of the hotel’s 611 guestrooms, there’s several places to score the perfect shot; the most popular of which are the Pierre-Dugua-de Mons Terrace and the top deck of the Québec-Lévis ferry. Further Quebec City thrills include hitting as many French-style bistros and cafés as time allows, touring the sinister jail cells at the Morrin Centre, and learning more about colonial history at the Plains of Abraham. Equally visit-worthy is the glistening Hôtel de Glace - the 44-room ice and snow hotel that’s the only one of its kind in North America. Declared a UNESCO World Heritage Site in 2007, the Rideau Canal is the iconic 126-mile-long waterway that turns into the world’s largest naturally frozen ice rink every winter. 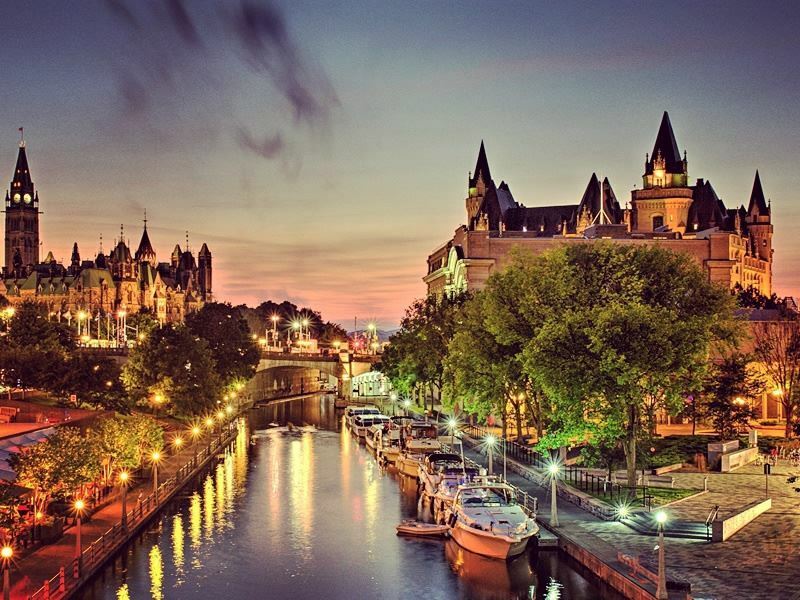 Head here on chilly days between January and late-February to capture the action on the 4.8-mile-long Skateway - a huge icy expanse (equivalent to 90 Olympic-size ice hockey rinks) that begins by Ottawa’s copper-peaked Parliament Buildings and extends to Dows Lake. The canal is open for round-the-clock sliding and gliding, and there’s plenty to tempt you along the route; especially the little chalets that sell soup, hot chocolate, apple cider, and deep-fried BeaverTails. And the canal action is just as cool in the spring and summer when you cycle the dedicated Canal parkways, picnic on the grassy lawns that line the shore, and rent a canoe or kayak to paddle these waters at your own pace. For photographers wanting to show the waterway’s life and soul through one single image, looking north on Laurier Avenue Bridge (between Elgin and Nicholas Streets) is one of the best vantage spots in any season.